If the human brain is considered a computer, what does that mean for science and our lives? Could we repair damaged areas, replace damaged parts, or even upgrade our own minds? It might sound like little more than the stuff of science fiction, but with current advances in brain-machine interfaces, science fiction is fast becoming science fact. Jessica Feldman is a neuroscientist and PHD student at Brown University who is working with, among other projects, the BrainGate Group. BrainGate is a team of neurologists, neuroscientists, and other researchers all working towards a single goal: developing technologies that will restore the communication, mobility, and independence of people with neurological disease, injury, or limb loss. The common term for this type of emerging technology is “brain-computer interfaces” (BCI), and it has the potential to change how we all interact with technology and the world around us at the most basic levels. Research into BCI began in the 1970s at UCLA under a grant from the National Science Foundation, and later DARPA. While research was initially limited to animals, the first human neuroprosthetic devices were implanted in the mid 1990s. One of the largest barriers to effective BCI is translating neural activity into an effective machine signal, e.g., “telling” a robot arm to move in response to neural activity. 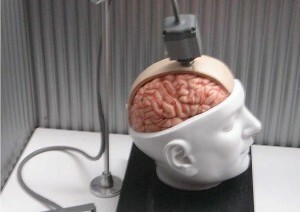 Advances in methods of recording neural activity such as EEG and ECOG have improved this technology somewhat, but it’s still a very unnatural process. The goal of BrainGate and researchers like Feldman is to create natural “biomimetic” interfaces. Basically, thinking about picking up a glass of water would cause the machine to complete the complex collection of actions to pick up a glass of water. The key to unlocking this type of interface lies with intracortical electrodes, says Feldman. These tiny wires are implanted in the brain’s cortex, and allow a single neuron’s activity to be recorded and mapped. Using a group of these wires, and taking up less than the space of a penny, allows researchers to record more complex signals. However, the potential rewards are worth the effort, and “huge strides are being made,” says Feldman. The BrainGate neural device (currently in FDA human trials) has assisted individuals suffering from spinal cord injury, brainstem stroke, and ALS. At this stage, it allows individuals to control a computer cursor by thinking about the movement of their own paralyzed hand, or to use a mechanical arm to pick up and sip from a coffee cup simply by thinking about doing it. Since the technology involves physically implanting wires into the human brain, issues of safety and the longevity of the device must be thoroughly addressed. This is the BrainGate team’s next goal so that the device can move beyond the research stages. The ultimate goal, says Feldman, “is to have a product that is an assistive medical device that can be used by any person with paralysis,” that can “restore their mobility and independence.” While the components are bulky now, as the technology continues to develop, miniaturization becomes more and more feasible. The BrainGate team currently is working on creating an autonomous system that is capable of wireless transfer. Feldman says that the aim is to create a device that can wirelessly communicate with a control unit that is small enough to be carried in a person’s pocket. The current research and technology is focused on restoring mobility and independence to paralyzed individuals, but the potential applications are virtually unlimited. Decoding the signals of the brain and analyzing brain patterns opens up avenues for epilepsy research, artificial limbs, and understanding neurological diseases. Says Feldman, “at a basic neuroscience level, we’re learning about brain circuitry, neural circuitry, how things work. We’re able to study how the brain works for the first time at the micro level.” The real discovery in BrainGate’s research is how cognition becomes behavior. In the end, the question isn’t what the implications of this research could be, but is there any area of human life that this technology would not effect?